Enjoy understated elegance when you vaporize with the new Alivi8. This vaporizer is a new introduction from quality metal ware makers, Red Eye. They’ve just topped themselves by producing this beautifully engineered portable vaporizer. The vaporizer itself is comparatively small and easily fits into your hands. Its size allows you to tuck it in your pocket! It feels solid to the touch and you’ll be glad to know that it’s built to last. The design is very simple which contributes to its quality appearance. It mimics that of an elongated bullet. The sides are smooth and gently curved. The edges are smoothed down and the mouthpiece feels extremely nice. All in all, Alivi8 gives a solid tactile feel to the senses. If you want a piece of cutting edge technology, Aliv8 delivers with its space age heating and evaporating methods. What makes this a stand out from its peers is the patented vapor path. This means that even if Alivi8 is made of metal, there’s no danger to you getting burned. Neither does its flame fuelled property detract from its function since you can control the amount of heat, as well as your inhalation. Alivi8 is put together in such a way that flame from your lighter does not touch or burn the herb of your choice. 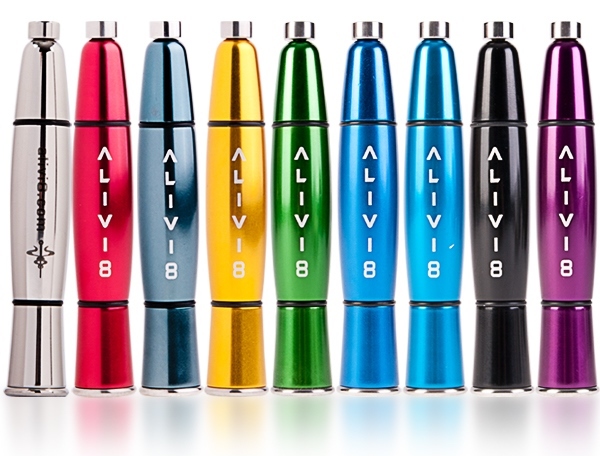 Alivi8 will charm you with its understated packaging that showcases 4 ounces of well crafted stainless steel. It comes with a small instructional piece of paper. Taking it apart gives you the following: vape filter system, body, vape maze path and mouth piece, and a tiny poker. It also has a convenient jar for spare parts. It’s now available online and it can be quite thrilling to be one of the first few to try out this handheld vaporizer. The pros of getting an Alivi8 vaporizer is its function of course, a full 2 years warranty, and bragging rights when you’ve gotten past some learning curves, not to mention how hip you’d look with one. They can be hard to find in the US but EZVapes.com carries the entire RedEye line including the Alivi8.